Marilyn Beaird wouldn’t know what to do if she didn’t go to Lambert’s Cafe every day. After all, she’s been employed at the home of “throwed rolls” since 1974. “They’re good to work for,” she says of the Lambert family, which has owned the business since 1942 when Earl and Agnes Lambert, with 14 cents between them, borrowed $1,500 to open a cafe in Sikeston, in southeastern Missouri. Their son, Norman, took over the business in the 1970s and ran it until his death in 1996. Norman expanded the business to southwest Missouri, opening its Ozark location in 1994, and another location, in Foley, Ala., opened just after Norman’s death in 1996. Today, Norman’s sons and widow are in charge. Every generation of the family has been good as gold to the employees, Beaird said. “It’s more like a family,” she says of her co-workers and bosses. Beaird is one of many employees who have been with Lambert’s for decades, not years. The Ozark location’s general managers, Jeff Johnson and Paul Brewer, basically grew up among the throwed rolls. 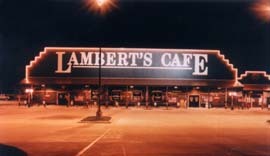 Both started working for Lambert’s as teens and are still working there 20 years later. 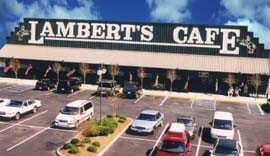 And Lambert’s is still packing people in, even after 65 years in business. Midafternoon on a Friday — well after lunch and well before dinnertime — the Ozark cafe has a waiting list for tables. “We sure are fortunate people are willing to wait, and I think it says something about the experience, that people are willing to wait for it,” said Brewer, whom everyone calls “Wally,” a nickname he’s had since he was young. 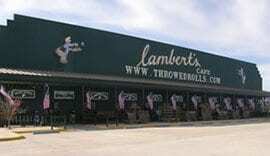 In addition to the high-flying rolls, Lambert’s is also well-known for its “pass-arounds” — fried okra, fried potatoes and other Southern delicacies that staff bring to diners for free. The cafes are also noted for generous portions and down-home hospitality. Servers always wear bow ties and suspenders — a nod to Norman Lambert’s personal style.